Description of "A STASTISTICAL LINGUISTIC ANALYSIS OF THE ENGLISH PHONEMES AND GRAPHEMES (eBook)"
As all of us know English has 26 letters to represent more than 40 phonemes or distinct sounds. Naturally, this imbalance between the number of graphemes or letters and phonemes or distinct sounds results in one letter representing more than one sound. In addition to this inadequacy, enormous borrowings from French, Latin, Greek and a host of other languages of the world over the years added a lot of inconsistent developments in English spelling. The influence of printers, writers and reformers has added variations to. These historical developments are well discussed in A Survey of English Spelling by Edward Carney, Spell it out by David Crystal and above all A History of English Spelling by Christopher and George Davidson. The first two are application oriented, whereas the last one is development oriented. Hundreds of books are available with an eye on phonics method in teaching English Spelling. Learn to Spell 500 words a day (in six volumes) by Camilia Sadik is a good example of phonics oriented books. There are computer aided publications as well in this area. The main thrust of the work is the quantification of the problem. I had taken about 15000 words found in Cambridge Learners’ Dictionary (2001 edition) as sample for this study and analysed them from different angles. The results are presented in charts and tables so that any one who is interested in the subject can benefit more easily. Five types of correspondence in four types of environment of the 26 English letters with the 40+ phonemes are presented cogently. In the chapter ONE TO ONE CORRESPONDENCE she has presented the picture of 16 English letters which have one phoneme each in one or more environments. In the chapter ONE TO MANY CORRESPONDENCE, 23 English letters which correspond to more than one phoneme each in different environments are described. In the chapter MANY TO ONE CORRESPONDENCE 28 phonemes which are represented by two or more letters each are presented. In the chapter SINGLE TO SEQUENCE CORRESPONDENCE 5 letters which correspond to sequence of phonemes each at different environments are presented. In the chapter SEQUENCE TO SINGLE CONRRESPONDENCE 17 different sequences of letters at the initial position of words, 37 different sequences of letters at the medial position of words and 21 different sequences of letters at the final position of words where the sequences represent single phonemes are discussed. I had tried to present the complexity in a simple way through this study. There are certain idiosyncratic instances of assignment of correspondences, division of sequences and a few errors of judgement. Inspite of these inadequacies this book is a welcome addition to the vast literature dealing with English Spelling. I had publishing only the letter to phoneme aspect in this book. Let us hope that I will publish the phoneme to letter aspect too soon. This one concentrates only on the present and that too words in isolation. It focuses on the immediate environments only. There too supreasegmetnals and grammatical elements are not taken for discussion. Inspite of these limitations it has its own contribution for researchers, teachers and reformers. Presently working as an Teaching Assistant of linguistics at the Institute of Kannada Studies, Karnatak University, Dharwad. I had got thirteen years of Teaching and fifteen years of Research experience. Having M.A. in Linguistics, M.A. in Kannada, Ph.D. in Linguistics, Certificate Courses in Tamil and Russian, Diploma in Basava Studies and experience in Computer Applications. I was attended a number of seminars and workshops and presented some papers as well. My Ph. 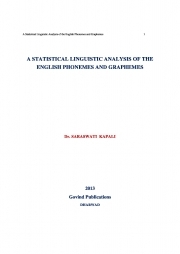 D. on “A Statistical Linguistic Analysis of the English Phonemes and Graphemes” is appreciated by the number of scholars as a significant contribution for Remedial Teaching and Spelling Reformation. My books based on this work are received well by the public at large. Reviews of "A STASTISTICAL LINGUISTIC ANALYSIS OF THE ENGLISH PHONEMES AND GRAPHEMES (eBook)"